With new stock size rotors. Will not fit HD (8 lug) vehicles. 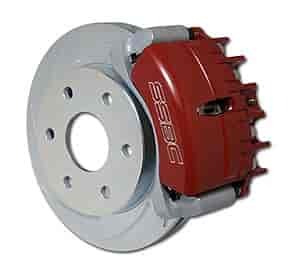 SSBC Performance Brake Systems provide bolt-on performance you can't beat. These kits are designed to replace OE brakes and fit most popular wheels. With maximum clamping force and even pressure distribution across the brake pad, SSBC kits offer the ultimate braking in a compact design. Made from forged or billet aluminum, kits are anodized clear for maximum corrosion resistance both internally and externally (some available polished or powdercoated black or red). Systems include Grade 8 hardware, necessary installation components, performance brake pads, slotted or cross-drilled rotors, braided hose, power boosters, and master cylinders. All calipers are made in the USA. Includes Tri-Power 3-Piston aluminum calipers, braided stainless flex lines, and turbo slotted rotors with Xtra Life plating. Does SSBC A126-39 fit your vehicle?